You may not notice it very much, but we depend on alkaline batteries a lot. We probably only realize its importance when our TV remote is not working anymore, and we have to buy new ones from the store. But what do we do with the used ones? How to dispose of alkaline batteries properly? In this article, we will share with you how this can be done so read along to know more about it. Alkaline batteries range from AAA to D. You can use these batteries for clocks, toys for children, in remotes, and many others. All modern electrical equipment runs on batteries, and alkaline batteries are fairly common and in use in every household. Alkaline batteries are those that cannot be recharged. The two poles are made of zinc (positive pole or anode) and manganese oxide (negative pole or cathode). Most of these batteries consist of steel, zinc, and manganese. Mercury is no longer used to manufacture alkaline batteries, making them safe and nonhazardous. These batteries are considered a very good option as they charge the device for a long time, last long, and operate well under all weather conditions, though it is not advisable to expose these batteries to long hours of heat. Another unsafe feature is that the electrolyte used is hydro potassium oxide. This is strongly alkali, and if it leaks, then it can cause great harm to the skin or eyes. When it comes in contact with skin, then that area should be washed with water. This happens because when there is a leak, then potassium hydroxide comes into contact with the air and transforms into potassium carbonate and breaks the electrodes and circuitry. According to environmental laws, this battery waste is not classified as hazardous waste as the characteristics of hazardous wastes are that they are highly ignitable, corrosive, reactive and toxic. Like we discussed above, there used to be mercury in these batteries before, but that is no longer the case now with these batteries. It is safe to say that they are harmless to the environment. 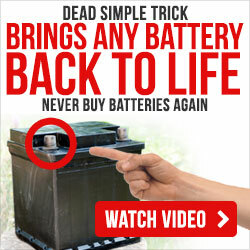 But we should still dispose of them the right way or you can go to our homepage to learn to bring back a dead battery. There may still be laws that state that alkaline battery waste is hazardous so you should be sure of your community laws and regulations and act accordingly by disposing of these alkaline batteries as per your community laws. There are certain other rules too that you must follow when thinking of ways to recycle alkaline batteries. Your community will have a department of sanitation so you should call them up and check if they arrange to pick up for alkaline battery waste. If they do not provide a pickup, then you should drop off your old used up alkaline battery waste at a drop off a site dedicated to this waste. You could also directly dump these batteries in your garbage can/boxes as these batteries pose no or very little threat of causing damage. But you must make sure that these batteries are not exposed to fire. Fire would make these batteries explode. This explosion could pose a risk to your well being and harm the environment by air pollution. Usually, these batteries are environment-friendly when disposed of in small numbers but in large numbers, these batteries can cause hazards, and when you have around 100 batteries to dispose of then you should contact the local government to confirm how you can dispose of them. What you can do as an environmentally friendly step is to make sure that you are not disposing of large of quantities of them in one go. Also, do not try to separate alkaline battery waste from normal garbage as that would be counter-effective. What should you do when you do not like to throw them in the trash? You should stop buying them in that case. You should buy rechargeable batteries then. Storage tips include making sure that batteries are stored in their original packaging, and not with other batteries. Storing various batteries together can cause them to react which can be very harmful. You may also try sticking tape to the posts of these batteries so that there is no scope of these batteries touching metal or other batteries. Another important facet to take care of is that these batteries are not rechargeable and one must not at any cost try and recharge them. A question that comes to mind is why not recycle alkaline batteries? It is because used up alkaline batteries are 99% of the time only thrown in the trash as they have no recycled value. Even though there is certain material in them which can be re-used, for instance, steel, zinc, and manganese but they still do not have that much value. The value of this material is too little, and the cost of recycling is equal to more than the worth of these materials. Some places collect these batteries but not for recycling. These places collect batteries to send bulk quantities of batteries to the landfill. You can safely assume that there is no way to recycle these batteries and once used, they have to be and should be disposed of. You will find no one in the business of recycling, unfortunately. If you would like to also learn about disposing of other batteries such as lithium batteries, then click here. It is rather unfortunate that there is no way to recycle alkaline batteries. The best way to answer the question of how to dispose of the battery is to check with your local government so you’ll know if there is any drop off points where you can take your used alkaline batteries. Or you can also avoid using alkaline batteries and instead, use rechargeable ones, so you don’t have to throw them when they run out of power. If you want to know more about proper disposal of different types of batteries, send us an email, and we’ll share with you other useful information about it.